Let me just cut to the chase and say that I am going to bake my own wedding cake next year. Don't sigh like that! Don't give me that exasperated look! It was hard enough, acknowledging that I probably oughtn't single-handedly prepare dinner for fifty-odd guests on my wedding day. Yes, I know it will be a busy time, I know I will be spazzing out about a million other things, but I am going to make my cake, okay? I had never made a stacked cake before, beyond regular layer cakes - never anything tiered. (in fact, last time I made an eight-layer peanut butter cake, the middle layers oozed woefully out one side. A delicious, embarrassing mess!) The point of my first trial cake was to learn the rules of Big Cakery - that is, what makes it stand up? What keeps it from collapsing into itself? How do you stabilize a cake? I decided to focus on these questions and leave fillings and decorating for another trial. The first thing I learned is that different types of cake are good for different styles. 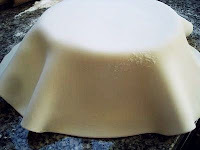 Light, airy cakes like angel food or sponge cake are good for sheet cakes or tall cakes with separate tiers, but bad for stacking, since the cake itself can't provide much support. Shortened cakes (pound cake or any basic butter cake) have a higher density that can make tiers precarious, but is great for stacked layers. For my first trial wedding cake, I wanted to stack - so I went with a shortened cake: Tish Boyle's Basic Golden Cake Layers (The Cake Book, page 120; recipe approximated here). I made one-and-a-half times the recipe for three layers: a five-inch, a seven-inch, and a ten-inch. I divided the batter to an even depth between the three pans (though, in retrospect, I should have added a bit more to the biggest pan, to give that layer a little extra height), and baked them for 45, 50, and 55 minutes, respectively. I cooled them in the pan for 30 minutes, then removed them onto cardboard circles I had cut out of cereal boxes and covered in foil, and let them cool completely. To make the layers perfectly flat, I used a long, serrated knife to cut the domed top off of each one; then I cut each cake in half horizontally to create two layers. Obviously, I used the presence of the discarded domes as an opportunity to taste the cake. It was great! I know that some people are picky about having wedding cake be white, which is achieved by excluding egg yolks, but I like the richness and moisture that yolks add, so I used a yolky recipe. The result was an ivory-colored, tender crumb that was just sweet enough and very vanilla-y. Delicious! Next up: icing. I had never made or worked with fondant before, so even though it isn't my favorite, I decided to give it a go. At the very least, fondant is great for sculpting decorations, so I figured I might as well give learn my way around that chewy confection. But first, the fondant needs a layer of buttercream to help it adhere to the cake and seal in moisture. I had read that buttercreams containing some vegetable shortening are good for outdoor events - which our wedding will be - because the shortening raises the melting temperature, so I decided to try it out and see how much the shortening affected the taste (I worked from the first recipe from this website, although I made a few minor changes). And, while the icing was easy to work with and didn't get too soft during assembly - despite my steamy summer kitchen - I felt that it was definitely "short" on flavor. I carefully iced each tier, spreading thick between cake layers and very thin on the top and sides, then put the whole lot in the fridge to chill and stiffen up a little, so it wouldn't goosh out the bottom when I applied the fondant. While the iced layers were chilling, I made my fondant. Now, I find that fondant, by and large, tastes like vinyl, but my soon-to-be-sister-in-law once made J and I an engagement cake with fondant made with marshmallows (rather than the traditional corn syrup), which I found more flavorful and delicate, so I went with that. It couldn't have been easier - I put 16 ounces of mini marshmallows in a large bowl with two tablespoons of water and microwaved it for about two minutes, pausing every thirty seconds and giving it a stir. Once the marshmallows were melted, I poured the warm, sticky mass out onto a heavily-greased counter and kneaded in a pound and a half of powdered sugar (with equally heavily-greased hands - take off your rings or else!). Once the mass looked a bit like gluey bread dough (re-grease hands and counter when necessary), I added in another half a pound of sugar, a little at a time, and a teaspoon of vanilla extract. After about eight minutes, I achieved a firm, elastic ball of doughy fondant. (If it seems like it's tearing easily, knead in a little water, about a half a teaspoon at a time.) It's wise to let it rest for at least thirty minutes here before rolling it out. Once my fondant had rested, I divided into three balls, which I estimated to be appropriately relative in size. I cleaned my counter top and dusted it with cornstarch, then carefully rolled out each ball to about a 1/8th-inch thickness - some people prefer to work with a greased counter top at this stage, rather than starch, but bear in mind that if your fondant tears, sealing it back together without a line is almost impossible with greasy dough! About here, it became clear that I had made way too much fondant. I draped each sheet over the chilled cakes, gently shaping the edges with my hands (there's a special tool that makes this process a lot easier and more geometric), and used a serrated knife to trim off the plentiful excess "skirt." Now for assembly. I inserted four evenly-spaced dowels into each of the bottom two layers to provide support; wooden dowels are advised, but I don't have a saw and I hadn't thought to use drinking straws, which would have been better, so I used sucker sticks, which are made out of tightly-rolled paper. I was worried that they might disintegrate in the moist cake over a period of days, but they ended up working just fine. Anyway, I trimmed each stick to be exactly level with the fondant, then rested the next layer on top. (If this had been an important cake, I would have measured, but my eyeballed efforts looks fine.) The last step is to insert a long, sharpened dowel all the way through the cake from top to bottom, piercing the cardboard cake boards as you go, but I didn't have a long or sharp enough dowel, so I skipped that step and hoped for the best. I hadn't intended to decorate at all, but the foil-covered cardboard glimmered out from under each later slightly, so at the last minute I added some bright green food coloring to my leftover buttercream and dabbed on some messy impromptu ruffles with a Ziploc baggie (I haven't bought a pastry bag or decorating tips yet). Suddenly I had something approximating a St. Patrick's Day cake - but that was alright. It was upright, symmetrical, stable! Victory! We sliced the top layer after dinner. I wasn't anticipating a flavor powerhouse or anything, but like most wedding cakes, the taste was a bit of a letdown. The cake itself was moist and tender (Tish's cookbook never lets me down), but the buttercream was a little waxy, and the fondant...well, it was better than most fondant, but, you know. - No slipping, sliding or sinking occurred at any point, despite the fact that the cake underwent various forms of transportation over the weekend to a number of friends' houses, without a central dowel. So A+ for structural integrity! - A layer entirely encased in fondant (no missing slices) stayed very moist and fresh for three days; sliced cake dried out quickly, even when wrapped up or protected with parchment paper. - The buttercream improved over time as some of the sugar crystallized and acquired a little texture. I also realized that it would have been much improved with an extra bit of salt. Also, most people who ate the cake seemed to like the buttercream more than I did, so maybe I'm just sensitive about shortening. - Nobody likes fondant, even good fondant. So I guess I'm ruling fondant out, despite its protective qualities. This scares me a little, because the hardest part of making the cake was getting the buttercream even (some tools would help) and keeping it crumb-free. Any advice on how to keep pesky crumbs out of pristine buttercream? I also think that my brief flirtation with vanilla-all-the-way wedding cake is over; at the very least, I'd opt for a lemon curd filling. I'm definitely ready to discard the White Wonder and move on to more adventurous flavors. Speaking of which - my best friend is getting married in a couple of weeks, and she's commissioned me to make a cake for their informal affair. A red velvet cake! It will be a small crowd - maybe twenty people, tops - so I think I might take the opportunity to try pillars! On the subway! I think my blog has found a theme...? 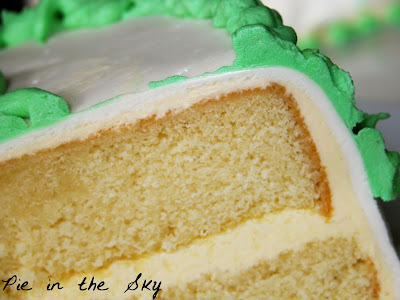 -How much cake layers are affected by being frozen (should they be iced first?). 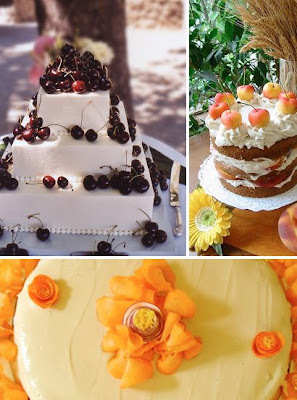 Lastly, have any of you readers enjoyed memorable wedding cake (or other-event-cake)? What was special about it? Why not try some marzipan instead of fondant, it makes a nice smooth surface and is much better to taste! You go, girl! I'm impressed (though agree on the lemon curd--much superior to plain vanilla). 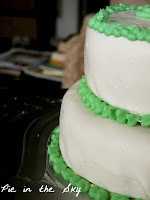 I was at Molly/Orangette's wedding last summer and she made the cakes (lots of rounds, no stacking). It was the first wedding cake that really tasted good. Chocolate and fudgy. But I am swooning for that square cherry drenched cake. Gorgeous--as yours surely will be. Your worry over a collapsing cake inspired me to substitute 'cake' for 'star' in this wikipedia entry: Gravitational collapse of a cake occurs at the end of its life time (i.e. wedding reception), also called the death of the cake. When all cake-ular energy sources (sugar and fat) are exhausted, the cake will undergo a gravitational collapse (and may bring down surrounding earthlings as the cake blows off its outer envelope - read "fondant")in its final explosion. In this sense a cake is in a "temporary" equilibrium state between a gravitational collapse at cake-ular birth (batter) and a further gravitational collapse at cake-ular death (decomposition by stomach acid). The end states are called compact cakes, such as a white dwarf cake (i.e. for small weddings). It is easier to frost a chilled cake than a room temp one. Chill your layers, apply a thin "crumb coat," chill again, and then frost with another layer of buttercream to minimize visible crumbs in the frosting. Good luck! I agree with jibbers that you should do a crumb coat on a chilled cake (a thin layer of frosting designed to catch the crumbs and get a good surface to start with.) The put each tier back in the fridge and chill again before you put the "real" layer of frosting. What helps with this process and to get everything even is a heavy-duty cake decorating turntable (with a cast-iron turntable). It makes everything so much easier!! Also, I have made three chocolate wedding cakes and they have always been a hit for taste - I am also a big fan of dark chocolate ganache frosting too. Unfortunately, I do not have any cake-making advice (although I successfully made your banana/black bean empanadas for a big crowd a few weeks ago, and those went off smashingly well! ), but I am looking forward to seeing, and sampling, whatever majestic wonder you create for the big day. So excited! ur so brave to make your own cake! i applaud you. i would be probably hyperventalating and making a right royal mess. but then that's me...i made lemonade squares the other day and a bomb looked like it had exploded in the kitchen. if i get married one day im having a cupcake wedding cake! good luck with perfecting your wedding cake. 1. Your engagement cake fondant was made with corn syrup, not marshmallows (they aren't vegetarian). Maybe that accounts for why the flavor was different? 2. Buttercream - I have a couple of good yummy recipes if you're interested. 3. Crumb coat - typically you'll want to do a separate coat of thin buttercream icing before the "real icing" that you'll do before the fondant. Meaning 3 icings. The first is the crumb coat and will keep all of the crumbs sticking to the cake. 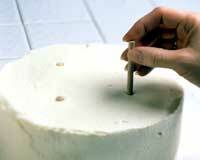 You may want to brush over your cake initially with a slightly-abrasive sponge pad or glove to remove excess crumbs. Then a thin thin layer of buttercream. Refrigerate it for at least 30 minutes and then go back to do the thick buttercream. Remember that after each pass over the cake, you'll want to wipe your spatula so that you aren't introducing crumbs to your icing bowl. Then refrigerate again and keep the cake cold until you're ready to put the fondant on. That will keep your edges crisp so they won't get rounded. I've never frozen cake layers, so I don't know what good that would do, but I'd say definitely get some icing on there first. Cream cheese frosting will melt like ice cream. I wouldn't recommend it for a cake made in advance or for hot weather. Hm... I didn't realize I knew so much about cakes... Enough Food Network for me!!! plume - great suggestion! i'll definitely give marzipan a go during a future practice round. m-y (wink) - you are crazy. have i ever told you about glod's replacing "plaintiff" with "unicorn" in his legal documents? jibbers - ah, THAT'S how they do it! thank you for answering my question!! It looks brilliant! I love homemade wedding cakes. 'Professional' ones look so fake and unappealing most of the time, the don't look like cake to me. More like stacked hat boxes. We were going to make our own wedding cake, but we got offered professional ones as a wedding present and as pretty much the whole wedding is going to be homemade, we decided getting rid of one task was probably sensible. It would have been fun though! 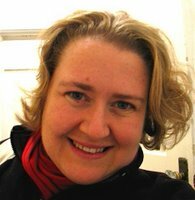 I can't wait to read how you get on with your experiments! Oh I love cake. My favourite food by far! how cool are you, kate? that is amazing that you're going to do your own wedding cake. when i got married, we also ran into the problem of finding a wedding cake that tasted great - - the final layers were...pumpkin with cream cheese buttercream and pumpkin with maple buttercream! let me know when you'll be in the ATL again! i think making your own wedding cake truly makes you a daring baker! and i wholeheartedly reinforce angela's advice about a crumb coat. it makes all the difference in the world. and speaking to you as someone who's two weeks from their ceremony, it's totally possible to do as much as you want for your own wedding as long as you're willing to make a time table and stick to it. and as long as you know your priorities and what you can stand to lose if you feel overwhelmed, you'll be more than fine! love, jahnna, josh, and zoe. Kate, you're the coolest person I know. I wish I were your neighbor and/or beneficiary of all these lovely kitchen experiments! Yummm. Making your marshmallow fondant (MMF) is a whole lot easier if you have a kitchenaid and dough hooks!